Whether you need weekly lawn maintanence, spring aerating, or spring/fall cleanup or just someone to pick up those broken tree limbs, we are here to help do anything you need, we can do any job at a resonible price, and service you can depend on year after year... Call or email us for a fast free estimate. We offer 12 month or Monthly Service to Commercial as well as Residential Customers. 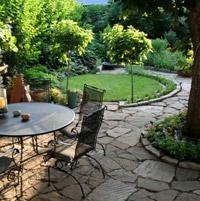 This list includes some of the lawn care services and landscape maintenance that we provide. We can tailor a maintenance program to suit your needs. *Lawn Mowing - This includes string trimming, edging, blowing and removal of clippings from all walkways, etc. and usually requires 38 visits per year. *Trimming Trees & Shrubs - This usually requires 2-3 trimmings per year. *Weeding - This includes plant beds, weeds in concrete, etc. We use hand-pulling, This is performed as needed. *Mulching - We use hardwood, cedar, cypress, or pine straw. Re-deep edging and fertilizing plant beds is recommended when mulching is done, usually twice per year. *Turf & Ornamental- This Includes Aerating, Fertilizing & Overseeding. A landscaped and well-maintained yard will help deter a criminal from approaching your home. Burglars tend to choose homes with overgrown lawns and shrubs which indicates that your home may be vacant or that you're not very concerned about the security of your home. The following lawn care tips will help you improve security at your home. Keep shrubs and trees trimmed, especially near doors, windows and walkways. Also avoid shrubs and trees that block the view to your neighbors' homes. This will give both you and your neighbors the ability to watch each other's homes. Keep your yard and driveway clear, never allowing newspapers to accumulate in your yard, on your driveway or near your front door. This gives the impression that you are away from your home. Keep your lawn furniture and ladders put away so a thief will not have an opportunity to use them to gain access to your home. Keep taller trees trimmed away from your roof so that the branches cannot be used to climb onto your roof or into your second floor windows. 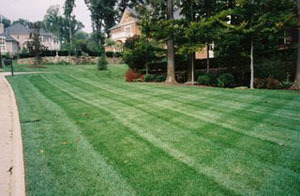 We will evaluate your lawn and let you know what your specific landscape and maintenance needs are.